Nestled against the James River, in the back of a quiet neighborhood, sits a red-doored, brick house, similar to many one may have passed driving down West Cary Street. Save for an unobtrusive sign right off the road, one may not even know of its presence. This site, however, contains over 250 years of history, covering six families, multiple war-time occupations, and two counties. It saw the rise and fall of the landed gentry in the colonies, the birth of a new country, the realities of generational slavery, and itself received new purpose when the National Society of the Colonial Dames of America in the Commonwealth of Virginia purchased it in 1932. Wilton even traveled over 15 miles from, “World’s End” to the heart of Virginia, standing today in its capital city of Richmond. Wilton now serves as a historic house museum, engaging with the full extent of its history for any and all who wish to cross its threshold. 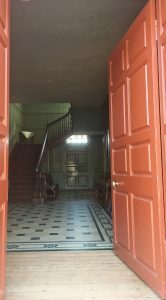 With the relaunch of the Wilton House Museum Blog, you receive an open invitation to catch a glimpse of all that lives behind that large red door. Here, you can learn about material objects, the enslaved communities of the area, American history, day-to-day life across the 18th and 19th century, and so much more. For those individuals who remember our old blog, “Found in the Collection,” there will be posts which revisit those articles, pulled “From the Vault.” The blog will have information about upcoming events at the museum as well, such as “Plays in the Passage,” concerts, and lectures. Interested in what you see on the blog? Come visit the museum, and take a tour inside the house, or learn about the landscaping of the grounds with our downloadable Grounds & Architecture audio tour. 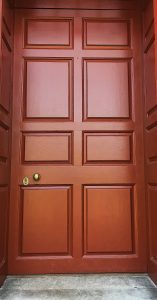 Please accept this humble invitation to walk through the open door, and immerse yourself in history and culture, at Wilton House Museum. Wilton House Museum opens Tuesdays-Fridays at 10:00 am, Sundays at 1:00 pm, with the last tour entering the buildings at 3:45 pm every day. The museum is closed on Mondays.